This raises the temperature as long as there is wood inside the house to fuel the fire. Unfortunately, at night when the fire goes out, so does all the warm air. Right out the chimney. We wake up to 56 degrees on the first floor! We have curtains up between some less used rooms and the main hallway to keep the warm air contained. That hallway is very cold! We bought a "Heater Fan" for Elizabeth's room. 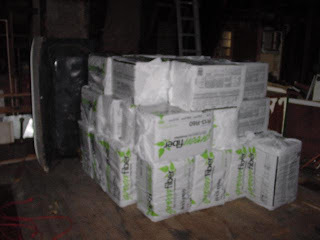 50 bags of blow in insulation. I get to borrow the machine for free except that you get it for 24 hours with a 20 bag purchase. I negotiated 2 days since I really didn't have to buy all 50 bags at once. I have to go back to pick up the machine when I have some time because it took 4 hours to make two trips to the big box retailer and haul those 50 bags up three flights of stairs to the third floor! The plan is to spend New Years Day blowing this stuff into the floor of the "attic." Fortunately we have many floorboards already ripped up so this should be a relatively easy task. When done it should give me an R-value of around 26 between the second and third floors. That will keep some of the heat in and reduce our pellet use - I hope. We bought 4 tons of pellets in September. We have used 3 1/2 tons almost. I have one ton still from last year. Looks like we need to buy another 4 tons. It makes me wonder how they heated this house around 1890. I know it had a coal furnace but one would have to shovel coal in it constantly throughout the day. I have to fill the pellet stoves first thing in the morning and last thing at night or they will run out of pellets causing the temperature to drop. So now I am running around doing some last minute rewiring of the bathroom before the insulation goes in because it will be much harder to do it after Friday. Stupid stuff like moving a light switch so that it isn't behind the door when it opens. Of course, when I installed the switch the first time we didn't have a door or a toilet for that matter! So now I have to come up with something to hook the original switch to. I'm thinking wall lights but that means more wiring! You might want to try an edenpure electric heater. Ours heats up to 1000 square feet. They are cool to touch and are safe to run all day. Also, are energy efficient. We use ours to supplement our front living room since we don't have a radiator in that room. It might help during the cold days. HTH. Wow, and I was whining about 68, I'll shut up now. It's nice to see you settling in and I hope the blow-in does the trick. My attic still lacks this and I pay for it each year. 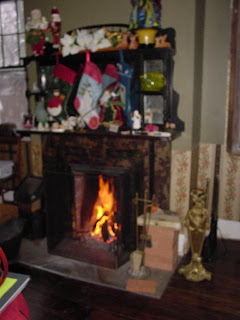 On the heating back in the good old days there is one thing about coal, it burns hot and long, we used to assist our fuel-oil burning furnace with a coal burning stove in the house I grew up in, the coal did not have to be changed out as often as wood. Also, back in the day, people had help that would come in and start the fires in the basements, my mom was telling me about this when she grew up. They had steam heat and she remembers a man would go into the basement before everyone woke up and start the coal fire. Being the norm these services were cheap and coal was cheap and plentiful. Hence no insulation. Yeah, coal burns long. During the renovation we use coal stoves, and throwing in 3 briquettes makes the fire last all night (actually over 14 hours even). A furnace/boiler for a whole house does take a lot more coal I guess, but probably the fire is bigger too, so you can throw in more coal at once. My mom had a coke fired apartment heat system when she grew up. Like a central heting system but with a boiler in the kitchen of every apartment. My grandfather had a "gas spit" he used to light the oke/coal. I feel your pain. We tried a coal furnace in an attempt to heat our 110 year old house in Virginia (all 4000 sq feet), and had to go down every hour to feed the furnace. Not. fun. We took shifts, I fed it all day, and my husband fed it all night. After that wore us down, we gave up and heat the first floor now with a heat pump, and the second is unheated. Our plan was to do a heat pump for the second floor, but, the electric bill is insane. I keep the temp at 65 on the first floor to keep the bill somewhat affordable, and the temp on the second hovers between 40 and 50 on a good day. Our way of dealing with it is that we move down to the first floor for the winter, and buy sweaters, lots of sweaters :-) Some days I question my love of old houses, especially these chilled-to-the-bone days. But, a warm spring day comes along, and I forget (maybe block out ;-) the memories of winter. I suppose the plus side is that I save on AC. I'm so happy to have warmth in the summer, that I never turn it on. Good luck! I hope the insulation installation went well -- it makes an enormous difference. We are veterans of all sorts of old house heating systems, from ones that work, to ones that didn't exist at all -- spent 4 years in a 19th century NYC railroad flat with no central heat. 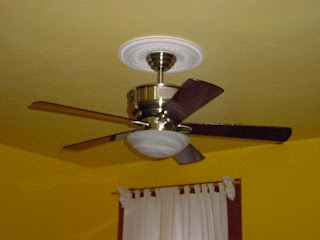 I found your blog thru Pecan Place Victorian -- I may get exhausted reading how hard you are working on your former crack house; we've hit the stage where we are actually hiring people to do work at our old house -- but it took us 31 years to get there. Congrats on your election. Good luck! You're a brave guy. Joys of a brick house! Once it's cold it stays cold. Our house in Cincy had a coal bin full of coal when we bought it left over from the old days. My neighbor down the street still burns coal and he was more than happy to haul it out of the basement a bucket at a time. We are still in the major insulation phase of our restoration. Fortunately its a frame house so we can actualy insulate the walls.